In order to attain the maximum satisfaction of our esteemed clients, we are engaged in manufacturing, exporting and supplying the best-in-classExtraction Condensing Steam Turbine. Our provided turbines are widely used in aviation, engineering, automobile and other industries. The offered turbines are manufactured from the premium quality components as well sophisticated technology by our adroit professionals. In addition to this, these turbines are available in different models and technical specifications for our prestigious patron’s. 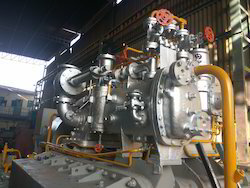 Looking for Extraction Condensing Steam Turbine ?